The global laboratory equipment services market, in terms of value, is projected to reach USD 11.51 Billion by 2021 from USD 6.50 Billion in 2016, at a CAGR of 10.0% during the forecast period. This market is expected to grow faster in terms of volume than value. Growth in this market is mainly driven by increasing research in pharmaceutical and biotechnology industries and the growing need for the timely and effective diagnosis of diseases. 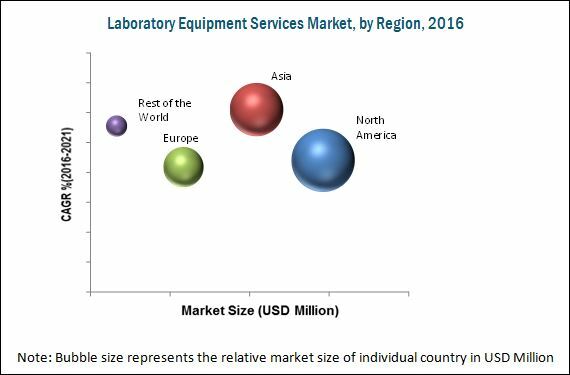 The laboratory equipment services market is segmented based on service type, equipment type, service contract, service provider, end user, and region. The laboratory equipment services studied in this report include repair and maintenance, calibration, validation, and other services. The repair and maintenance segment is expected to provide growth opportunities for market players in the forecast period. North America is expected to dominate the market in 2016, with the U.S. accounting for a major share. However, Asia is expected to grow at the highest CAGR during the forecast period, due to the rising focus of pharmaceutical and biotechnology industries on developing Asian countries for conducting clinical trials. This is because these markets offer a significant cost advantage and have a skilled workforce. Key players in this market include Agilent Technologies (U.S.), Danaher Corporation (U.S.), Thermo Fisher Scientific Inc. (U.S.), Waters Corporation (U.S.), and Mindray Medical International Limited (China). Other players include Eppendorf AG (Germany), Pace Analytical Services, Inc. (U.S.), Hettich Instruments, LP. (U.S.), and Merck Millipore (Germany). This report categorizes the laboratory equipment services market into the following segments and subsegments. Market size and growth rate estimates for Latin America, Pacific countries, and the Middle East & Africa. The global laboratory equipment services market, in terms of value, is projected to reach USD 11.51 Billion by 2021 from USD 6.50 Billion in 2016, at a CAGR of 10.0% during the forecast period. This market is expected to grow faster in terms of volume than value. Growth in this market is mainly driven by increasing research in pharmaceutical and biotechnology industries and the growing need for timely and effective diagnosis of diseases. Furthermore, developing markets such as India and China and the increasing number of asset management companies provides significant growth opportunities for the laboratory equipment services market. On the other hand, factors such increasing focus among healthcare providers to reduce the cost of treatments, growing pressure on pharmaceutical companies to reduce the costs of marketing their drugs, and high cost of service contracts for the servicing of laboratory equipment may restrain the growth of the market. The laboratory equipment services market is segmented based on service type, equipment type, service contracts, service provider, end user, and region. Based on service type, the market is segmented into repair and maintenance, calibration, validation, and other services. The repair and maintenance services segment is expected to account for the largest market share in 2016. They key factor driving the growth of this segment is the rising use of laboratory equipment for diagnosis purposes and research activities. Based on end user, the market is segmented into clinical and diagnostic laboratories, pharmaceutical and biotechnology companies, and academic and research institutions. Clinical and diagnostic laboratories dominated the market in 2016. This market segment is also expected to grow at the highest CAGR during the forecast period. The market is dominated by North America, followed by Asia, Europe, and the Rest of the World. While North America is expected to dominate the market in 2016, Asia is expected to grow at the highest CAGR during the forecast period. The high growth of this market is attributed to the increasing focus of pharmaceutical and biotechnology industries on developing Asian countries for conducting clinical trials. This is because these markets offer significant cost-advantages and have a skilled workforce. Prominent players in the laboratory equipment services market include Agilent Technologies (U.S.), Danaher Corporation (U.S.), Thermo Fisher Scientific Inc. (U.S.), Waters Corporation (U.S.), and Mindray Medical International Limited (China). Other players include Eppendorf AG (Germany), Pace Analytical Services, Inc. (U.S.), Hettich Instruments, LP. (U.S.), Merck Millipore (Germany), PerkinElmer Inc. (U.S.), Siemens Healthcare GmbHý (Germany), and Hitachi High-Technologies Corporation (Japan). 14.3 Thermo Fisher Scientific Inc.
14.11 Pace Analytical Services, Inc.